My "Sprouts" came home tonight wanting tacos in the worst way. AND I was way short on time... but tacos were what the natives were demanding, so tacos they got! I coarsely grated some zucchini, tomato, carrot and onion and flash-sauteed it for less than a minute, just until the tomato got mushy. The "tacos" turned out deeee-lish, and more importantly, my kids gobbled them without asking for (veggie) Taco Meat or 'cheeze' or olives or beans or salsa. All items I usually have on hand (except tonight). They aren't even tempeh fans but that didn't seem to matter either. I thought they looked rather pretty, with all those colors, too. Speaking of pretty, here's a Mother's Day picture of my Sprouts (which they hate! ), complete with matching tee-shirts which I forced them to wear since it was MY day and I nostalgically wanted them to "match". I love, love tempeh! But strangely, I've never made tempeh tacos. It has such a nice ring to it...tempeh tacos! Yum! And cute kids! I love that you made them wear matching shirts! 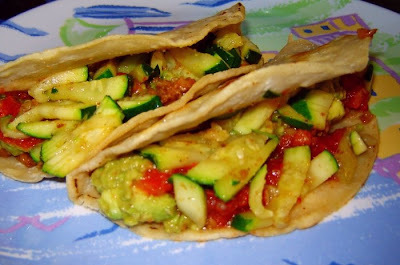 Love the vegetable-filled tacos that you made!! Yum!! Man, those tacos look and sound delicious! And the sprouts are adorable. Girl, all I can say is I'm glad I don't live at your house or I'd weight 500 pounds! You are an incredible cook! Your food looked delicious and your kids are darling.I love the fact that they matched for Mother's Day! Ok, I have to try those this weekend. They sound really yummy! Thanks for sharing the recipe.